Whether you like it or not 2004 is a transition year between old and new technologies. It will be expensive for enthusiasts to keep up with the changes Intel are serving up all at once, but in the long run it will be worth it... at least that's what we're being told. On the outs is proven hardware like the AGP slot, DDR memory and for Intel, the ATX motherboard. The replacements for each of these technologies promises a lot, but we may have to wait a while to see if they truly deliver. 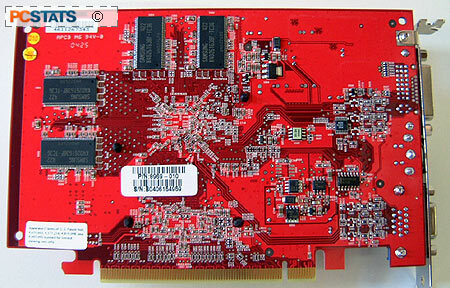 Take for example the good old PCI bus. It's a bottleneck for modern systems, and the tiny 133MB/s pipeline is laughable by today's standards. After twelve years of service it's finally time for PCI to retire. What brings this retirement about is the recent release of the Intel i925X and i915P chipsets, each of which support the new PCI-Express interconnect. As PCI-Express motherboards slowly filter into the market, manufacturers are quietly placing emphasis on getting their mainstream PCI-E cards out and into PCs. After all, mainstream videocards are the type of videocard most often bought by consumers, and pushing $600 cards at the introduction of a new (and unproven) slot doesn't make that much sense. As the Intel computing world becomes more familiar with PCI-Express, expect more high end, and native PCI-E solutions to crop up. Before we get to far ahead ourselves, let's focus in on the card PCstats.com is testing in this review; the MSI PCX5750-TD128 videocard. The MSI PCX5750-TD128 is a PCI-Express x16 solution based on the venerable nVidia GeForcePCX 5750 core, and comes with 128MB of standard DDR memory running at 500MHz. The bright red card supports S-Video output, and of course comes with all the necessary cables in the box. An additional DVI-to-analog converter is included so users can configure dual monitors if they prefer as well. 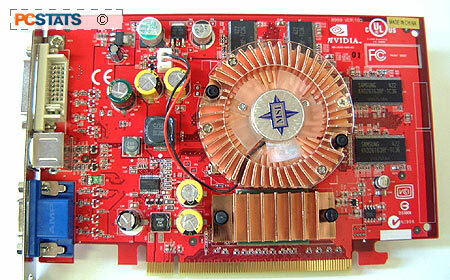 Aside from the PCI-E x16 connector on the bottom of the card, it would hard to tell the PCX5750-TD128 apart from the reference GeForcePCX 5750 AGP videocard. Both feature pretty similar components, and indeed the GPUs are identical. Beneath the small aluminum heatsink situated below the brains of the videocard is the HSI bridge chip. 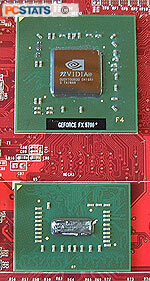 The HSI chip allows the natively AGP core to communicate over the PCI-Express interconnect. MSI have really pulled out all the stops on the software bundle that ships with the PCX5750-TD128, it comes with a small mountain of games including Prince of Persia: The Sands of Time, Uru, and about twelve other titles. Considering that the entire package retails for just $202 CDN ($153 US), MSI have certainly put together a compelling package! In the last few years manufacturers have been equipping their videocards with ever larger, ever faster fans to keep temperatures down. Temperatures have dropped down, but cards have become pretty loud. With an eye towards keeping things cool, and quiet, MSI have applied their "Silence Starforce" cooling solution here. According to MSI, this cooling solution produces a maximum of 28 dB noise. During testing, the MSI PCX5750-TD128 did remain very quiet. Marketing slogans aside, that is all we really need to hear.